Psalm 104 beautifully describes God as the creator who creates the world without moving a muscle. He commands and the great oceans move to their proper places and more accurately to hold within their boundaries! The same is for everything else as we see today because God made them to be. As we read through the verses of Psalm 104, Genesis chapter 1 becomes very clear and we slowly begin to grasp the purpose of the waters separating and land dividing and mountain rising and the list goes on until He creates a man in His own image. At this point, we are out of breath because we cannot fully comprehend the goodness and the greatness of what a loving God is providing for His creation! 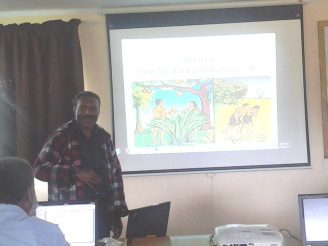 And after we catch our breath from what is happening in Genesis we recover and look again in Psalm 104:16 – 17 to pick out our current purpose of why we should provide basic computing course for pastors in Papua New Guinea. Verses 16 and 17 of Psalm 104 teaches us to reflect on the provision made for all creatures; just as God planted the cedars of Lebanon that provide a place for the birds to make their nests and the stock to make a home, we believe God has given us a unique ministry in Christian Radio Missionary Fellowship (CRMF) to provide technical help to the churches. The synonym for “nest and home” in the context of Psalm 104:16-17 is “hub”. 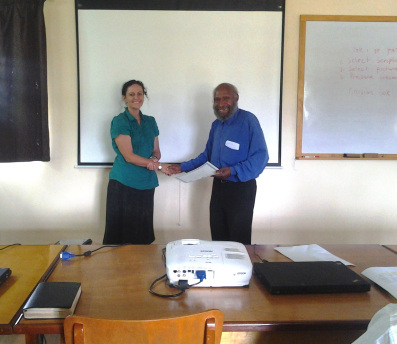 Rachael Wakefield in presenting the certificates to the Christian Apostolic Fellowship (CAF) pastors made this following statement; “We want CRMF to be seen as a hub that can provide help to the different churches that come to us”. 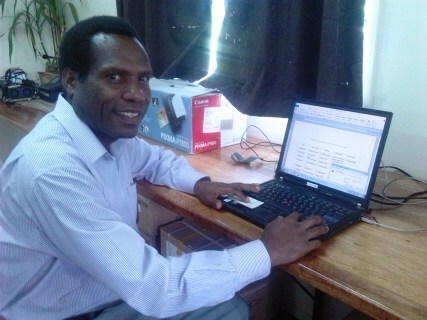 Michael Wakefield made this statement when he officially welcomed the seven participants form Enga Province who made it to the second Basic Computing Training (BCT 2) “We are prepared to give our best to those who come to us for help”. The two above statements sum up why we want to continue to provide assistance in computer training and Bible storytelling to pastors from different churches. CAF is one of our key partners whose focus is for the remote communities in Enga, Madang, Simbu and West New Britain Provinces. We have planned to do training with CAF in these provinces later this year. The leadership of CAF is excited with these plans that they decided to send two of their pastors to understudy our Learning Technology staff who are currently conducting a Bible Storytelling workshop in another venue. 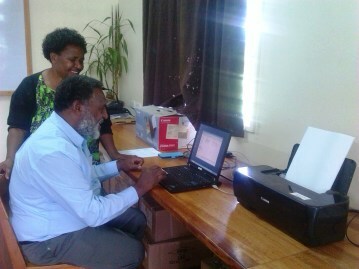 Pastor Wayman Kati assisted by his wife and fellow participant Ruth to print his document. In this training we were able to cover the saving of files on a flash drive and taking it to a printer to open the document and print it. We set up the printer in the training room so that each participant could actually save and print their individual documents. 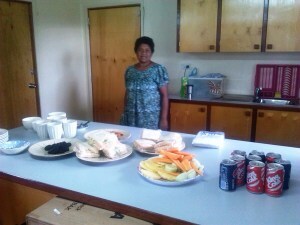 We encouraged others to train their fellow participants in order to gain knowledge and confidence while helping others. The participants also had training and demonstrations on how to prepare and present a sermon using the Microsoft Power Point Presentation 2010. They were also trained to connect their laptop to a video projector. The participants also had training and demonstrations on how to prepare and present a sermon using the Microsoft Power Point Presentation 2010. They were also trained to connect their laptop to a video projector. Pastor Steven Kungu was one participant who delivered a short sermon using Global Recording Network’s (GRN) pictures and Scripture. Pastor Steven was thrown out of school in his early school days because he could not read or write. His supervisor Ps Wayman Kati was all praise for him because he jumped from being illiterate in the “paper world” to become computer literate in this training. We thank the Lord for the partnership we share with CAF and ask your prayers for the rest of the training plans with CAF. A special thank you to you all for supporting and praying for the ministry, just as God provided for all of our needs let us be considerate in helping others without losing sight of the bigger picture that God provides everything.